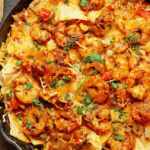 Blackened Shrimp Nachos - Update your Super Bowl menu and game day eats with tons of flavor and spice. These are the best seafood nachos ever! Or if you are making your own using shrimp, add 2 tablespoons olive oil to a cast iron or heavy bottom skillet over medium high heat. Season shrimp with blackened seasoning by adding to a bag and shaking the shrimp to make the seasoning stick evenly. Fry shrimp in an even layer for 2 minutes on each side and set aside.